A racist social-media post by an Anne Arundel County student after her team lost a basketball game on Monday is drawing outrage. 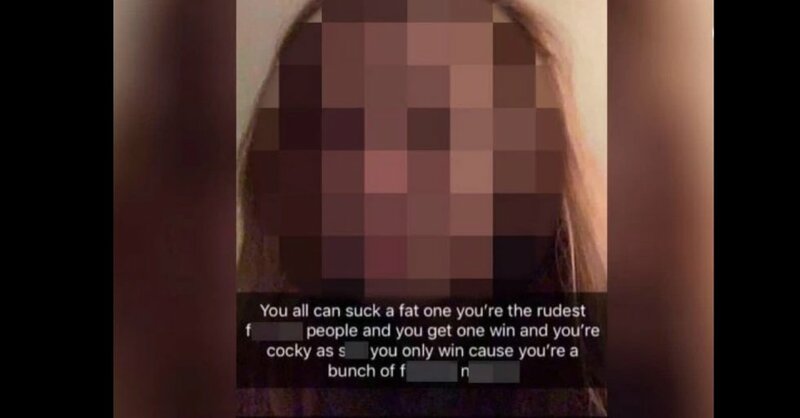 The female student reportedly went off via Snapchat after Broadneck High School lost a basketball game by one point. The message was initially sent as a private message, but it soon became public after it was posted online. A screenshot of the video can be seen below. Broadneck High School principal, Jim Todd, apologized on behalf of the school and the student’s abominable behavior. He also sent a letter to parents assuring them that she would be punished. The letter from Anne Arundel County Schools can be read below as well. Todd took the time to state that one student’s action wasn’t a reflection of the thoughts of other students at the school. Although Todd’s words promote tolerance and understanding, the actions of various students throughout different schools in that specific district say otherwise. Anne Arundel County schools have an extensive history of racism against minority students. Instances of white students antagonizing Black students with threats and spray-painting swastikas on property have been well-documented for almost two decades. At Chesapeake High School, another learning institution in the same district, there was a social media threat “to kill all ni–as” early last year. A student also displayed a Confederate flag in his car at the same school. Nooses were discovered at Crofton Middle School, which is also located in Anne Arundel County. In fact, there have been numerous allegations of racism that administrators have had to address in the school district. It appears that the faculty are turning a blind eye to a very serious situation. The local NAACP has even attempted to offer a solution to end racist acts throughout the school district. In August 2018, Edweek.com composed a study over a three year span that documented almost 500 instances of racist occurrences in predominantly white schools. This speaks to a bigger issue in our school system. Clearly, children and teens are mimicking behaviors they’ve learned at home and those behaviors should be dealt with swiftly and severely.